Dater’s Handbook (2016) Rated TV-G | What to Watch. A successful businesswoman who is unlucky in love reads the Dater’s Handbook, hoping to turn her love life around. 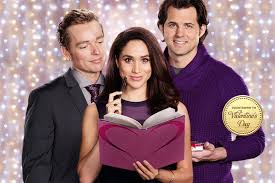 Starring Jonathan Scarfe, Meghan Markle, Lynda Boyd, Teryl Rothery, Kristoffer Polaha, Willie Aames. Although I enjoyed the actors and their chemistry, this Hallmark film had two intrinsic flaws that I just couldn’t get past. First, the main character constantly tells little white lies. They are quite small, like not telling her family who wished her a happy birthday first, but it bugged me. I don’t appreciate dishonest people, and the fact that she felt she had to lie about little things would lead me to believe I couldn’t trust her about bigger things. In addition, the story revolves around this same character choosing the wrong man to date. She tends to only date men she wants to change, and in conducting her experiment, she follows the same course. This didn’t make sense to me. That she wouldn’t change her dating habits for greater success made me think she was kind of dumb. Of course, there is the Hallmark clincher that makes her realize how ignorant she is, but it was too little too late for me. This film is a pass. This entry was posted in 2016, comedy, Drama, films, hallmark movies, Movie reviews, movies, Rated TV-G, reviews, Romance and tagged actors, boy, boys, business, character, characters, chemistry, date, Dater's Handbook, dating, family, film, film reviews, films, girl, habits, Hallmark films, Hallmark Movie, hallmark movies, hallmarks, happy birthday, Jonathan Scarfe, Kristoffer Polaha, life, love, Lynda Boyd, main, Meghan Markle, men, movie, movie reviews, movies, not worth, problems, story, successful, teryl rothery, trailer, unlucky, white lies, Willie Aames, woman, writing. Bookmark the permalink. Pingback: New This Week on DVD, January 24, 2017 | What to Watch.